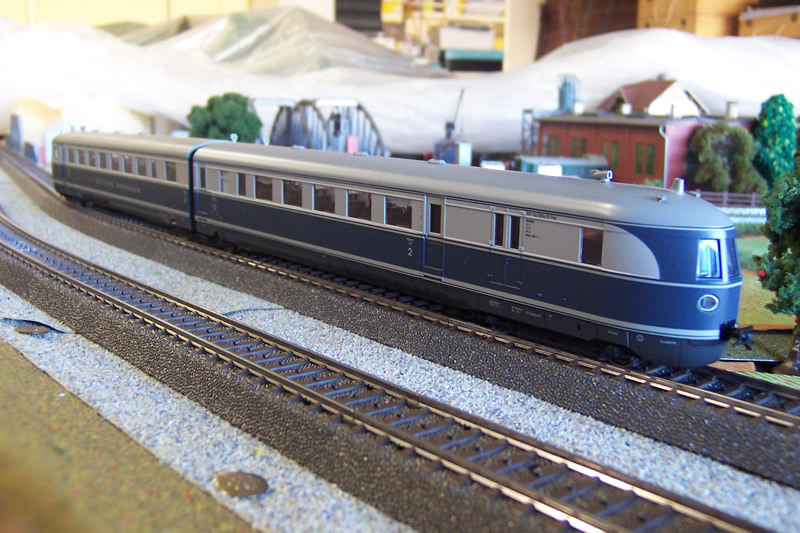 Maerklin model 37774. This is a model of the SVT137, the train used by the Germans in the 1930's to quietly test submarine engines, and at the same time, usher in a new flexible form of fast transport. The colour scheme is that encouraged by the occupying US Army who controlled the railroads in parts of Germany after 1945. This train looks as it did in the early 1950's in a colour scheme similar to those used by the Baltimore and Ohio, or the Richmond, Fredriksburg and Potomac on their new diesel engines. I might add that this is one brilliant model by Maerklin, moulded in metal. I did not have the lights on, but it is simply a stunner both in looks, with its fully fitted interior, and its digital operation and running. This model gets 10 out of 10. It does not hesitate at full speed, even on the smallest radius C track and switches. I give this model the uniquely Australian title of " blue tongue lizard", because it has a similar reptilian look.